I found this book somewhat difficult to read and absorb. 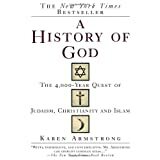 Karen Armstrong traces in detail our concept and thinking about God over 400 years. She does it by referring to the specific writings, teachings and thinking of dozens of philosophers and theologians in the Christian, Jewish and Islam religious traditions. Very thorough and engrossing at times, I found it very dense in places and difficult to sustain my attention and to understand. In different chapters she goes into great length on The Trinity, The God of Islam, The God of the Philosophers, The God of the Mystics, A God of Reformers, Enlightenment and the Death of God. Each one of these chapters could easily become a book in itself. To try to understand the trends in our thinking about God over the ages, I had found (and have since lost) a tiny little book by author unknown. In it he said that originally there was Grace (above the line) and Nature (below the line) i.e., wo(man) in the physical world recognized his permanent separation from God who is beyond any limit we can think of (as he told Moses simply, “I am”). Over the ages nature has ate up grace totally so that wo(man) became the upper entity (above the line) and nature (everything else is below the line). i.e, (wo(man) is now “God” and the mythic God of the Bible we knew is dead or nothing. We all certainly do not believe this, but for those who do have Faith, there is a distinct group (the mystics) who believe God is within each of us and our goal in life is to reach divine unity with Him in us through meditation and contemplation. i.e; heaven on earth. There is also the more recent Universe Story where believers believe we are made of stardust (matter is created in super nova explosions or black hole implosions so that is where we ultimately come from if I understand this correctly). The Protestant reformation and its claim of salvation through faith alone and revelation through scripture alone changed the Christian world forever. There was no longer an obvious need to “live a good life grounded in charity” in order to be saved some had argued. One merely had to accept the gift from God of having Faith in Him to know that one had indeed been saved. The lives of the Saints, “the Pope and the “Church”, intercessional prayers for others and Mary Immaculate were all “wo(man) made” traditions and no longer worthy of our attention or devotion. A monumental well researched survey of our changing concept of God, I would rate this book 3 stars out of 4 or 5.